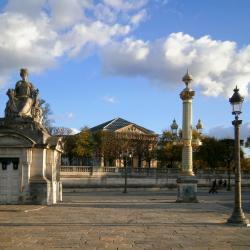 Looking for hotels near Sèvres-Babylone Metro Station? Le Petit Chomel is on a side street in the popular shopping and café district of St-Germain-des-Prés. On Place Saint Sulpice in the heart of Saint Germain des Prés, the Hôtel Recamier is a former Bourgeois family home. It features an elegant lobby with archways and high ceilings. The hotel La Villa Madame is located in Paris’s arty 6th arrondissement, in the Saint-Germain-des-Prés district. The modern air-conditioned rooms have a refined style and offer free WiFi access. Located in the heart of Saint Germain des Prés, the Hotel des Saints Pères, a former 17th century private home, welcomes you to the residence of Louis XIV's architect. This 18th-century hotel is set in the center of Paris, a few walking minutes from Saint-Germain-des-Prés district and 2461 feet from Musuem D’Orsay and the Seine River. Hotel Luxembourg Parc is located in the 6th arr. District in Paris, 0.9 mi from Noter Dame Cathedral. Guests can enjoy the on-site bar. The hotel staff were extremely helpful, friendly, courteous, and knowledgeable. The Victoire & Germain hotel is located in the Saint-Germain area of Paris, 0.6 mi from Noter-Dame Cathedral and 0.7 mi from the Louver Museum. The staff were so welcoming as a solo traveller after a long flight from Australia. In the center of Paris, Hôtel Baume is 500 ft from the Luxembourg Garden and 320 yards from Odéon Metro Station. It has free Wi-Fi, a terrace and a 24-hour front desk. Everything, I would definitely recommend to friends and family and even my company. Offering a patio, Hôtel Da Vinci & Spa is located in Saint-Germain-des-Prés district of Paris, 1969 feet from the Louver Museum. Free WiFi access is available. Clean, new, well maintained. Amazing staff! Hôtel Le Relais is in a 17th-century house and located just a 5-minute walk from Saint-Germain-des-Près Metro Station. This elegant hotel has luxury rooms with a minibar and an LCD TV. Amazing property in the perfect location to walk all over Paris. Artus Hotel is in the heart of Saint Germain des Près on Paris’ chic left bank. It is a boutique hotel offering a sauna and luxury rooms and suites, 1-minute walk from Mabillon Metro Station. Very good location for access to Metro. Lots of cafes to choose from within blocks of the hotel. Featuring a fitness center and a spa with a Hammam, Hotel Le Six is a luxurious boutique hotel in the heart of Paris. We loved every day of our stay here! Located in the heart of the Left Bank’s stylish cafe and shopping district, this hotel is less than 1000 ft from Sait-Germain-des-Près Metro Station. Perfect location friendly staff. Very accommodating. This 17th-century private mansion is set in the Latin Quarter, just 1148 feet from Odéon Metro Station. The luxurious hotel offers a jazz bar and an interior courtyard with a fountain. Excellent service, design and comfort. On Place Saint Sulpice in the heart of Saint Germain des Prés, the Hôtel Recamier is a former Bourgeois family home. It features an elegant lobby with archways and high ceilings. The staff was knowledgeable, gracious, and helpful. This 18th-century hotel is set in the center of Paris, a few walking minutes from Saint-Germain-des-Prés district and 2461 feet from Musuem D’Orsay and the Seine River. The hotel is lovely in a very nice location . Located in a 17th century building in the heart of the Saint-Germain-des-Prés district, just a 10-minute walk from The Louver, this hotel offers air-conditioned guestrooms and a courtyard garden. Everything was perfect - the facilities, the location, the timings. Set in Paris, 0.6 mi from Louver Museum and Noter Dame Cathedral, Hotel Clément features air-conditioned rooms with free WiFi throughout the property. Nice room and outstanding location! 9 minute walk to the Seine river. In the 6th district of Paris, this air-conditioned designer hotel is just a 2 minute walk from Duroc Metro Station. It has a 24-hour front desk and free Wi-Fi is provided in the contemporary rooms. The location was fantastic! You were able to get too and from everywhere super easily! Hotels with great access to Sèvres-Babylone Metro Station! This hotel is in Paris’s prestigious Left Bank district, just an 8-minute walk from the Louvre Museum. It has air-conditioned guest rooms with a period-style décor and free Wi-Fi. Staff and facilities were wonderful! Great neighborhood, right in the heart of Paris. The Hôtel de Lille is a four-star boutique hotel located in Paris, in the Saint-German-des-Près neighborhood. The rooms were gorgeous. The staff was superb. The hotel La Villa Madame is located in Paris’s arty 6th arrondissement, in the Saint-Germain-des-Prés district. The modern air-conditioned rooms have a refined style and offer free WiFi access. Clean, comfortable, bright room. Great location, walked everywhere. Located in the historical district of Saint-Germain-des-Prés, this 5-star hotel features a hammam and steam room. It offers Baroque-style guest rooms equipped with a flat-screen TV and DVD player. All the stall went beyond the call of duty to make sure we were taken care of. Esprit Saint Germain is set in the 6th arr. District in Paris, 0.6 mi from Louver Museum. It offers free WiFi and a fitness center with a sauna and steam room. The location and service were excellent. This classical style, 4-star hotel is located in the Saint Germain area of Paris. Hôtel De Buci offers luxuriously decorated rooms with antique furnishings in the heart of the Latin Quarter. Lovely room, warm soft bed, and an excellent location. The staff were very friendly & helpful.